This is the goal – overcoming my fear and trepidation of cold water. Unless you were on my swim team when I was growing up, something that most people don’t know about me is that I may be the world’s biggest cold-water wuss. It’s true. Getting into the water when it’s anything but a tepid bath or warmer is one of the most excruciating things I can imagine – and because I imagine it so much, it’s always worse when I actually have to do it. My kids and wife make fun of me at the pool because I am an inch-by-inch pool-enterer. My high school swim coach pointed out to everyone at our post-season swim banquet after my final season that I hadn’t ever gotten in the water on time because I hated it so much. And I recall vividly my time at ROTC Advanced Camp at Fort Lewis in Washington State, in 1990, when we had to build a “raft” out of our ponchos, stow all our gear in it, and swim down a river to test it. That water was literally in the forties (run-off water flowing down from Mount Rainier, I think), and I thought I was absolutely going to hyperventilate and pass out. I survived (obviously) but I still remember my heart being in my chest. I remember the Savage Race in 2012, with the Shriveled Richard obstacle, too: much like the famous Arctic Enema at Tough Mudder, this is an ice-water plunge where you have to go completely underwater. Ice is floating on the top because they have to keep reloading the pool (especially in June in Ohio when the Savage Race takes place) and there’s a barrier just above water level halfway across that you have to submerge to get past. I recall coming out of that pool and having to stop for a moment to get my heart re-started. It’s hilarious, until it starts to get in the way of stuff you want to do. And one of the things that frequently comes up in obstacle course racing, especially at the higher levels, is the cold water plunges that you have to be ready for. Even if you’re racing in the summer months, you may come across water that is colder than you’re ready for. And you just have to deal with it and go. And here’s the thing about those cold water plunges in a race: they don’t care if the air temperature is warm or cold, you’re still going in and you still have to deal with the cold once you get out. And yes, it’s totally mental. I absolutely concede that fact. But that doesn’t make it any easier. So it occurs to me that the best way to achieve anything is to give yourself a goal to get it done. And I know that Special Olympics Ohio does a Polar Bear Plunge at the Columbus Zoo each February. So… are you following me here? 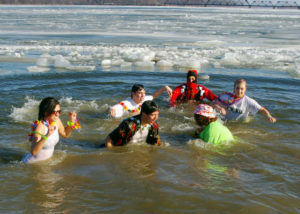 That’s right, I pledge that I’m going to do the polar bear plunge when it is announced for this upcoming winter’s event. I can’t find it yet online which leads me to believe it’s not been planned yet. I’ll keep you posted. (I’m shivering just thinking about it at this point). But yes, this is going to happen. And… I’m going to use the help of a gentleman named Wim Hof to do this. climbing Mount Everest to 22,000 feet in socks and shoes (before a foot injury stopped him). being immersed in ice for a world record of one hour, fifty-two minutes and change. completing a marathon above the Arctic Circle in Finland in temperatures down to −20 °C (−4 °F). The dude seems nuts, yet he’s teaching his techniques to people – a combination of breathing exercises and regular cold therapy. And the stories you hear about the success they’re having are pretty crazy. There’s a ton of great data out there about the importance of cold (especially cold-water) therapy, too. One of them I’ve mentioned before is for sports recovery – your recovery if you follow your exertions with cold water is vastly improved and sped up. Other benefits reportedly include improved sleep, improved immunity levels, better circulation, and more. It seems like a win-win situation all across the board. And from a totally different point of view, it’s always a good idea to be challenging your ideas of what’s easy, hard, and possible. To me, cold water seems like it’s just one of those things that only crazy people do. Well, it’s time to become one of those crazy people and I’m giving myself a deadline. Time to head off to check out the Wim Hof method and see what I can do to turn myself into a cold-loving machine! Who’s with me? Who’s tried this before? Join in the discussion on our message board! ← How Do I Just Get Over It?